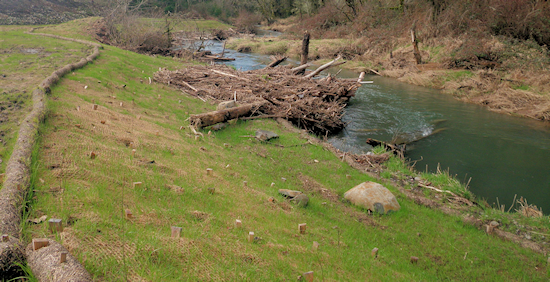 Saplings planted on the bank of Stout Creek will even­tu­ally grow to shade the stream and end up as the next gen­er­a­tion of log jam habitat. The strip of land beside your stream is a great place to plant trees. First of all, the 20 feet or so directly beside the stream prob­a­bly isn’t prac­ti­cal to use for most other pur­poses. Sec­ond, the banks are too steep. Third, there will prob­a­bly be sea­sonal flood­ing. Besides, a forested buffer zone along a stream is really beneficial. They shade and cool the air and the stream water. It’s what they’re know for. Trees actu­ally can clean the soil and the water per­co­lat­ing through it by absorb­ing chem­i­cals and other pol­lu­tants. Sci­en­tists have stud­ied how trees fil­ter sewage and farm chem­i­cals, reduce the harm­ful effects of con­cen­trated ani­mal wastes, and clean water runoff that enters streams. Trees slow storm water runoff and reduce the threat of flooding. Trees break the force of wind to help keep top­soil in place. Their roots bind the soil con­tribut­ing to bank stabilization. Trees cre­ate oxy­gen. A mature tree pro­duces as much oxy­gen in a grow­ing sea­son as 10 peo­ple inhale in a year. They also act as a giant fil­ters clean­ing the air we breath. Trees clean the air by inter­cept­ing air­borne par­ti­cles, reduc­ing heat and absorb­ing pol­lu­tants such as car­bon monox­ide, sul­fur diox­ide and nitro­gen dioxide. When they grow old and die, logs that have fallen into a stream will make great habi­tat for fish. Actu­ally a pretty good rea­son for trees, don’t you think?